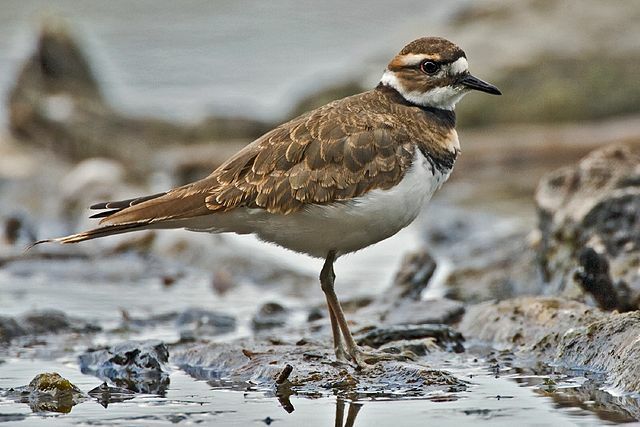 The Killdeer is a shorebird although you are as likely to see it in a grassy field as you are along a shore, even if there is no open water nearby. It’s a specific kind of shorebird called a plover and differs from other shorebirds by having a shorter bill with a swollen tip and feeding by sight instead of feel. Many also have chest bands, like the double-banded Killdeer. One of the functions of these chest bands is to break up the silhouette of the bird on the ground, making it harder for predators to see. Often you will see two Killdeer feeding on a gravel bar and after observing them for a minute or two you realize there are eight or ten of them! This disruption of the birds’ outline is called ‘disruptive coloration’ – just like zebras and tigers and angel fish. Like many shorebirds, the Killdeer builds a minimal nest, usually just a scraping of sand or gravel to form a depression. Four eggs are laid, narrow end to the middle so they fit tightly together. If one egg gets destroyed or eaten, the mother bird will replace it with a rock, to keep the eggs from rolling around. What the Killdeer is especially known for is its broken wing act. If a predator approaches, the parents will feign a broken wing and run away from the nest. The predator, seeing an easy meal, follows the “crippled” bird, which leads the predator astray and then flies off. The related Lapwing of Europe, Africa, and Asia gets its name from its similar behavior. But if a human, cow, horse, or other large animal gets near enough to the nest to step on it, the Killdeer has a different display, folding its wings over its head and running at the intruder to keep it away. After about a month, the precocious young hatch and are immediately able to run around. “Precocious”, from the Latin, means “ripened” beforehand and the fluffy birds are covered with down and ready to follow the parents and learn what to eat. Waterfowl, chickens and their relatives, shorebirds and others have precocious young. Birds whose young are helpless, blind, and naked when born, like songbirds, are termed “altricial”, from the Greek meaning “wet nurse.” Unscientific as it is, precocial young like chicks and ducklings and baby Killdeer, are just plain cute; altricial birds are pretty darn ugly in comparison. Killdeer are rather tolerant of humans and will nest on the edge of parking lots, tennis courts, on golf courses, and even on gravel roofs. You can’t miss them with their white chest, brown breast bands, and a red ring around the eye.